Welcome to Tool & Bark, your source for information on all manner of ways of working with wood, from sawing firewood to planing lumber, and from sanding a shelf to staining a deck. Whether you need to prune your hedge, clear your campsite, or turn a table leg – we have you covered. Tool & Bark offers general information on various tools that work on wood operate, so that you understand the advantages of different methods and technologies. And we provide detailed tool and wood product reviews and comparisons, so that you can make an informed decision when you decide to purchase. People have been working with wood since the beginning of time, and for good reason. Lumber is a renewable resource that is excellent for structural design and beautiful to look at. But trees grow tall, so wood needs to be cut into a variety of shapes and sizes depending upon the task. And since there are so many different ways wood can be used, man has developed many different cutting tools process trees into usable sections. Both electric chainsaws and gas powered chainsaws are excellent tools for cutting down trees (and electric chainsaw sharpeners keep them cutting fast), while limbers and hedge trimmers are great at dealing with branches. Firewood racks are great for stacking all the wood you cut and split (try an electric log splitter if you want to save your back). 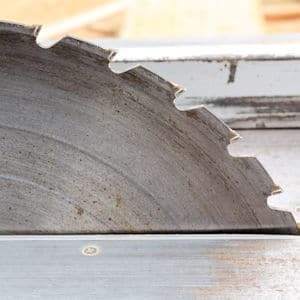 A good chop saw or mitre saw – especially one with a laser guide – will make sure you are nice and consistent when cutting studs and planks. Radial arms saws serve a similar function, and a circular saw is easy carry around the job site. Chainsaw mills allow you to mill your own lumber directly from felled trees. And a wood chipper shredder will allow you to process leftover branches into mulch. And that is just scratching the surface – scroll saws and band saws allow you to cut out patterns and shapes, and jigsaws perform similar functions. Comparing wood lathes is important if you are planning to do projects that require turning wood. Thickness planers are great for getting your wood uniform. And let’s not forget the table saw – indispensable for ripping planks and cutting sheets of plywood. We cover these cutting tools and more, to help you understand the specialties of each, and which models rise above their peers. While power tools (like this collection of the best drill presses or these cordless right-angle drills) are great, some jobs just require a hands-on approach. And you can tell that there are a lot of jobs like that in woodworking, because the number of hand tools available is dizzying. Axes and buck saws for chopping and dropping trees, hatchets and hand saws for similar jobs on a smaller scale. An adze is good for rough shaping larger pieces of wood, while mallets and hammers can help put things in place. Then there are tools like chisels and hand planers for shaping wooden projects, and coping saws and mitre saws for close precision. Rasps and good old sandpaper are useful for making rough wood smooth. A good benchtop drum sander or belt sander can do it much faster. But for larger area work you might want a deck sander. 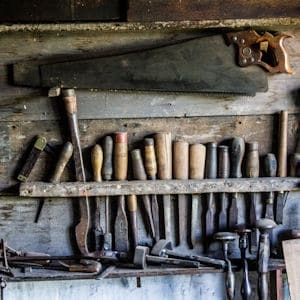 Whatever your need, if you have a love of working with your hands on wood, we cover the tools you will need in your workshop. Whether you are building your dream house or a dog house, wood is one of your best choices for construction materials. Sheds and barns, and most any other structure for that matter, can be built well with wood. And building with wood opens up another whole selection of tools. Some of them are power tools, like framing nailers and screw guns. 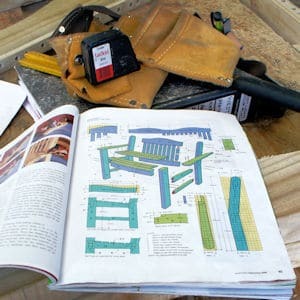 Other tools – like levels, squares, stud finders, pliers and plumb bobs – perform crucial functions for carpenters and builders who work with wood. Countless structures have been built with hammer and nails, using wood measured by a tape and cut with a handsaw. Of course, having straight, flat wood makes all the difference in the world when it comes to building with wood. That is why tools like jointer planer combo machines can move your product from the rough to finished categories. Sure, there are lots of fancy time-saving tools on the market. But with some jobs old-school methods, simple tools, and manual labor get the project built. Some tools, while not used directly on wood, still have a place in other parts of typical construction. For instance, electric demolition hammers are often used to remove concrete before new wood construction begins. And we don’t look at just tools – we also discuss other hardware used in wood construction projects, like in our review of barn door hardware kits. We also help you find the right gear for your wood shop, like in our review of the best dust collectors. There are dozens of types of wood you can work with. Softwoods like pine are often used for studs and joists, and pine boards are frequently employed on all manner of finished projects. 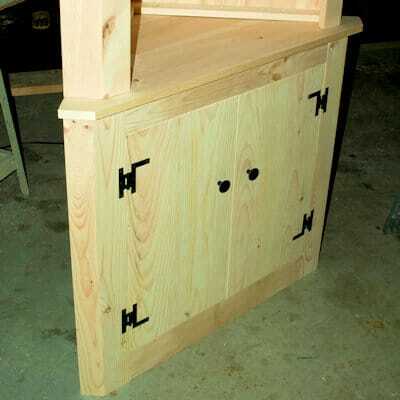 Using the right stain or polyurethane can make items built with inexpensive lumber into things of beauty. Hardwoods like oak have different uses. Their durability make them perfect for beautiful flooring, and furniture and cabinets made from oak are universally sought after. In today’s world of disposable products, handcrafted hardwood furniture and floors dated in centuries give testimony to the value of building with wood. Cedar has almost too many uses to count. Posts and shingles made from this wondrous wood stand up to damp environments without rotting, making it great for sheathing your house or putting up a fence. Inside a cedar closet or chest will keep your clothes smelling fresh and help keep away moths. Redwood makes a great deck, and is also frequently employed to make outdoor play sets. Spruce tops are favored by many instrument makers, and are especially good on fine guitars. When paired with mahogany or rosewood backs and sides and ebony fret boards, fine woods and craftsmanship can make wood sing. And that is just to mention a few frequently used woods. There are so many varieties to work with – ash, birch, cherry, maple, teak – the types and specialties go on and on. And at Tool & Bark we are passionate about them all.